Big data will become increasingly important to insurer profitability in multiple ways in the coming years, and the industry is starting to comprehend its potential. But carriers have been slow to embrace the technological possibilities compared to other industries, Fitch Ratings said in a new report. Fitch said that insurers largely use big data analytics for fraud reduction, which helps carriers rapidly spot claims trends that point to potential fraud—something that cannot be done so quickly with older methods. This is a crucial thing for carriers, Fitch said, because reducing fraud also helps slash related claims and investigation costs and gives insurers greater competitiveness and profitability. But there are other areas where big data can help insurers. Fitch pointed out that it is increasingly becoming a tool to enable more accurate motor insurance pricing. Consider: Telematics devices (used by Progressive and others) can track a driver’s mileage and braking habits. That data helps insurers adjust a policyholder’s premiums each month to reflect the most recent data. 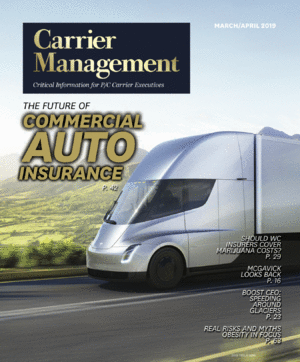 Telematics can also encourage driver safety, Fitch pointed out. Importantly, insurers can also use big data to formulate better catastrophe risk assessment, Fitch said. “Catastrophe risks, notoriously difficult to price due to their infrequent nature and the high correlation of losses, are being increasingly, accurately modeled by the inclusion of large, granular data sets from disparate sources [such as] details of tide height, sea-bed contours and coastal elevation to model storm surges,” Fitch said. Fitch also noted that some insurers are using big data to improve and customize customer engagement and also optimize their distribution channels. “Using real-time tracking, insurers can immediately identify sales spikes by product or intermediary that may indicate underpriced or mis-sold business, allowing fast remedial action, Fitch said. Commercial LinesCTO / TechnologyData & ResearchGlobal EconomyIndustry NewsMarketsNewsPersonal LinesStrategyThe C-SuiteU.S.